« Exilis Body Shaping is the Wave of the Future for Noninvasive Fat Loss! 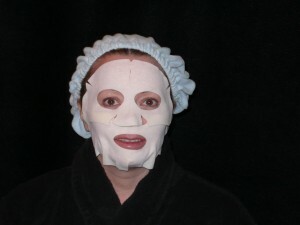 Me wearing the placental mask from Monte Carlo---EEEK!!! Just flew back from Monte Carlo, and boy are my arms tired!!! The meeting was terrific as usual, and I have lots of goodies to tell you all about. First off, there are two new things that are available right now in my practice; the Exilis Oscillating Wave Body Contouring Device to lose inches of fat without liposuction, and my new skin specific vitamin line “Genetiskin” is finally available after three long years of research and work. Check out the specifics on the Exilis and Genetiskin on www.lisazmd.com. Now, back to the meeting in Monte Carlo… as you all know, this was the third year that I have taught at the World Anti-Aging and Aesthetic Medicine conference. The physician turn-out was good, with over 4,000 attendees from 120 countries. Not many new machines were featured this year, although ultrasound is making its way into the marketplace as I predicted [and I already have the exclusive on the best device—the Exilis as I mentioned above]. There is another machine that I was very interested in, but I am keeping it a secret for now, my pretties, until I can get my hands on it for you. Let’s just say that it does something very unique! Otherwise, the focus was on the weird this year. There was one machine that required the operator to wear “ionic gloves” like Michael Jackson and you touch the gloves to the patient’s face, almost like “virtual reality.” I didn’t see any results with this, although if they put light bulbs on the surface it could beat out glow-sticks in a nightclub any day! The funniest memory that I will have of the meeting is getting into a virtual “cat-fight” with the Russian physicians clamoring over one small kiosk selling human placental products for the face. It was worse than a sample sale at Prada, but I did manage to bring back a couple of masks and creams to test on myself to see if they are worth importing for you all. I tried the mask last night, and it did leave my skin soft and smooth as silk. It looks pretty freaky while you are wearing it, but there is no smell, and no irritation, so it passed the first test. I’ll try the lotions for a couple of weeks, and if it’s worth having, I’ll bring enough for the entire class. That’s it for now. I have to go and make my traditional slide show for everyone’s enjoyment. This entry was posted in Anti-Aging, Cellulite, DOCTOR TALK- Scientific Journal Update, NonSurgical Body Sculpting and tagged Anti-Aging, cosmetic surgery. Bookmark the permalink. Both comments and trackbacks are currently closed.